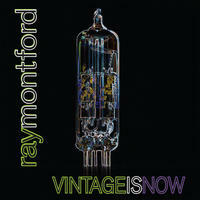 Ray Montford : Vintage is Now. Evocative, melodic and haunting instrumental guitar music. There is something to be said about someone having the courage to release an instrumental album in 2012, and looking to make a dent in the pop-drenched landscape of the music world. Ray Montford, the virtuoso guitarist and Canada's own aficionado of the 6 string, has done just that and done it with great style, grace, and conviction. His 11 track and sixth studio album Vintage Is Now is as beautiful a collection of guitar lead compositions as it is raw and uninhibited. Picture a journey on a magic carpet ride over a turbulent and roaring sea while laying on pillows of silk and down, flying through the white capped waves. Opium dreams you say? Montford knows exactly how to evoke these grandiose visions with his flawless playing and keep you in a state of unencumbered sensory bliss the whole way through. Could Ray Montford be Canada's own Jeff Beck? With this gift of an album where so many emotions are touched on throughout, one has to think he may just be carving out his own path as a guitarist and letting his playing do the talking. Perhaps no one could ever fill the shoes of the guitar gods of the past but it doesn't seem that Ray has set out to achieve this shadow goal. His playing is unique, honest, and still enthusiastic which is rare these days as instrumentals go. His love for the guitar shines through the music which in essence keeps you, as the listener, so connected to his playing. Ray's songs become the canvas of ones imagination and boldly paint a vision where voice and lyrics have no place over the roar of one man and his guitar. License Evocative, melodic and haunting instrumental guitar music by Ray Montford for your project. Play the music of Ray Montford in your restaurant or store. Are you for real by Processor: industrial acid house.